As promised, I did something on my GTX0 checklist. 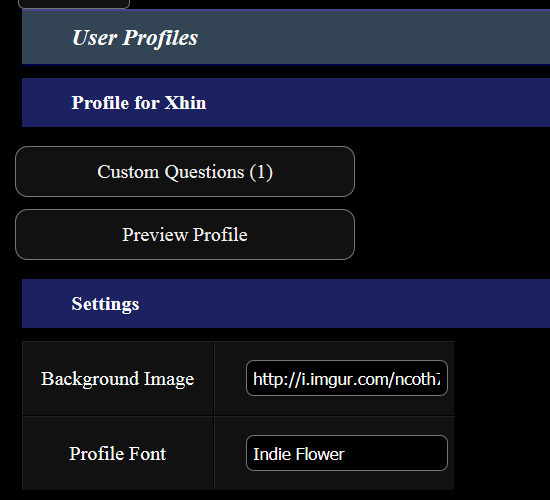 There's now a new panel in your User CP (third one) called "Edit Profile". First pick the username you want to edit. 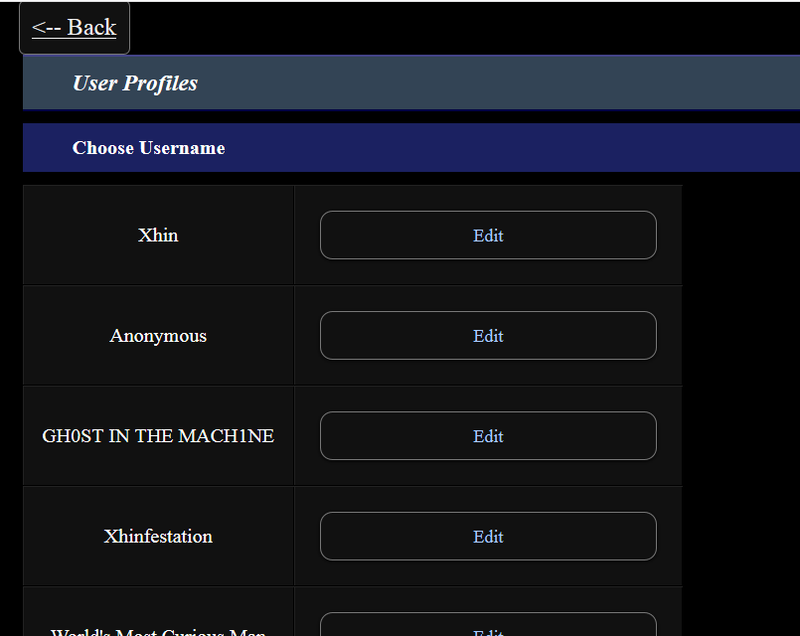 Like MyCards you can have multiple profiles for each of your altnames. You can set the background image for it, as well as the font. There are a *lot* of fonts there to choose from. You also get to set which Questions appear in your user profile via the self-duplicating box. 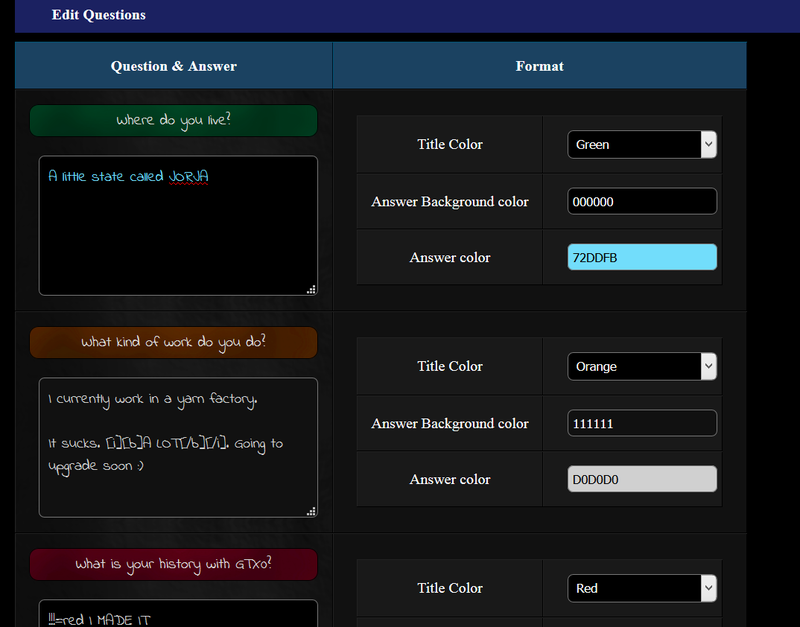 Below, you get to edit the answers to those questions. You also get to edit the format. Changing the format will make the boxes to the left change automatically to reflect it. Note also that the font is represented here, but because of how it works, this won't change automatically; you'll have to click submit and may even have to do a hard refresh (ctrl+shift+r) to see the font changes in this panel. I might be able to fix that eventually. For the answers, note that the full GTX0 parser is supported.. you can add colors, pictures, tables, youtube videos, etc to your liking. 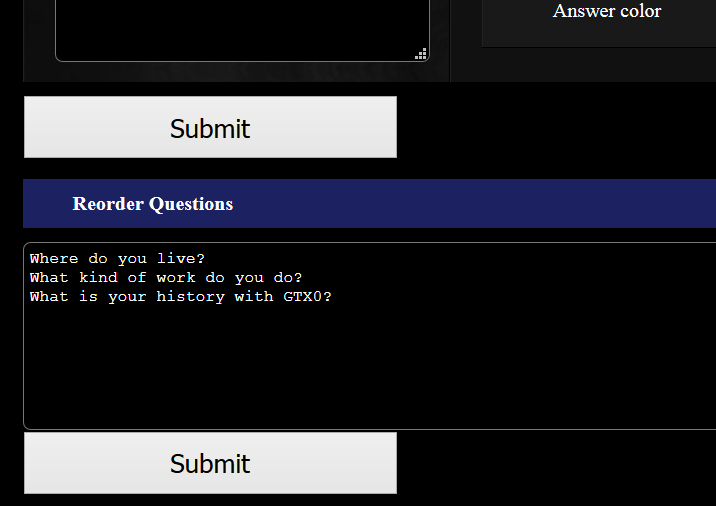 Below that, you can reorder questions. The way this works is you just copy and paste the questions in the order you want them, one line per question. Don't worry if you have extra spaces; the parser will take care of them automatically. Here you get to see your actual profile. Note that there should be a "Preview Profile" link at the top of your panel. 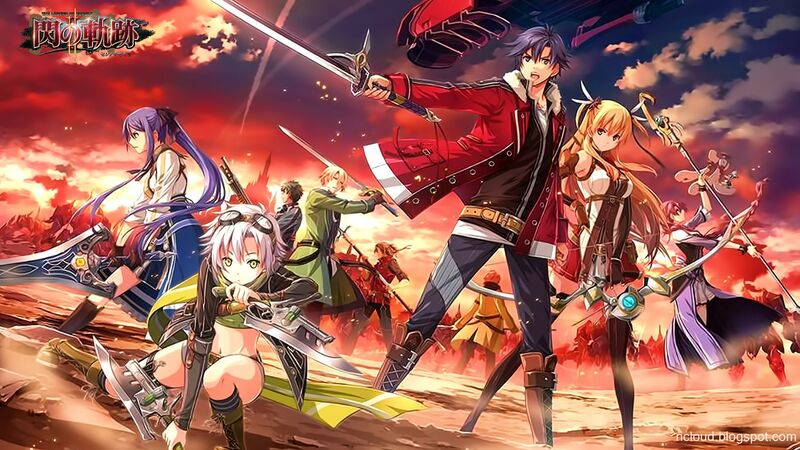 There's a lot more top space than seen here so your background image comes through. Note also that background images are 100% width and height so it will cover the entire screen. 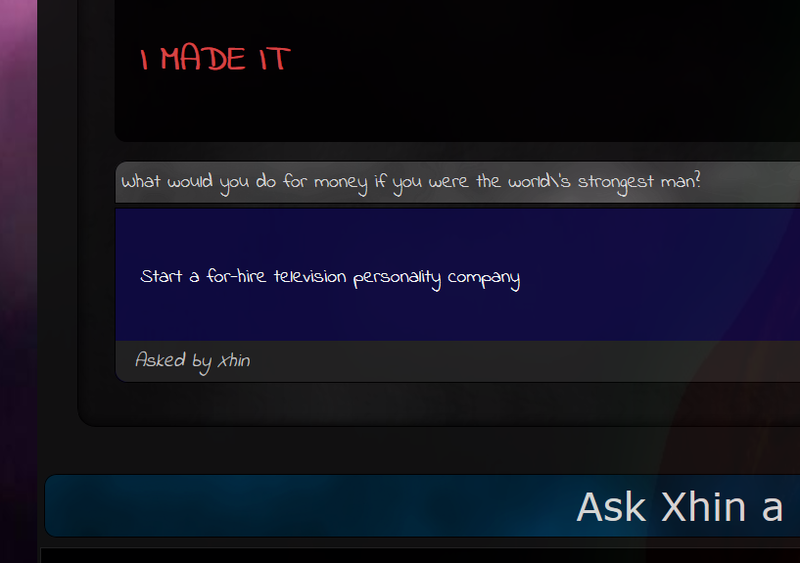 At the bottom of any profile, including your own, if you're logged in you have the ability to ask that user a question. That will then appear at the top of the profile panel, with a number indicated. Here you can submit an answer to the question, or delete it. Once you have an answer in place, it'll appear here with the other questions and you can format and/or reorder it accordingly. When a custom question is in your profile, it'll have a little tagline saying who asked it. 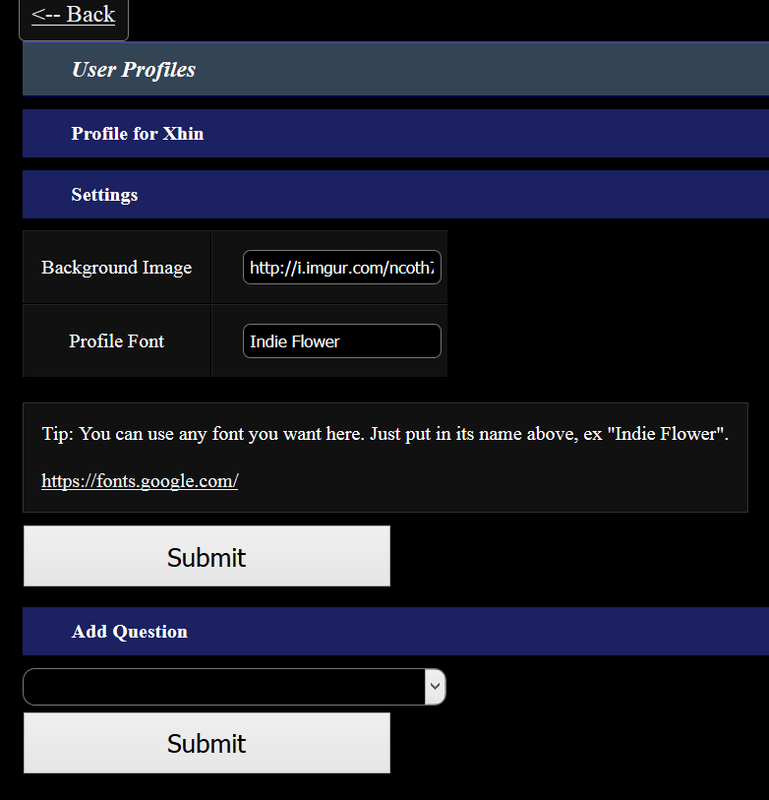 At the moment, the sole way profiles are integrated into the site is by having an underline underneath their username. I'd like to make this a little neater at some point, but at the moment it's more important to quickly track who has profiles and who doesn't. I also want to integrate the profile system into other "thread views" / "who's here" / "people tab" / etc systems at some point when there are actually more profiles around. Feel free to request profile features. Like the MyCard system (and all new systems, really), this feature is very easy to edit and/or streamline. I can also add other global questions if you guys have any good ones. I just threw a few together for the time being. One neat thing about the new profiles system is that eventually I'll be able to aggregate answers together.. like with the "Location" question, I can have a page that lists all the answers from everyone. Same deal with contact information, which should be highly highly useful. When we get a better private messaging system and the MyCons system, they'll be integrated with the profiles system. Also @Count Dooku: since it was one of your requests. That's what the "Site Feed" link at the top of the site is. It also scrolls with you so it's always available. So background and font don't seem to work at all? Unless my phone is being odd? 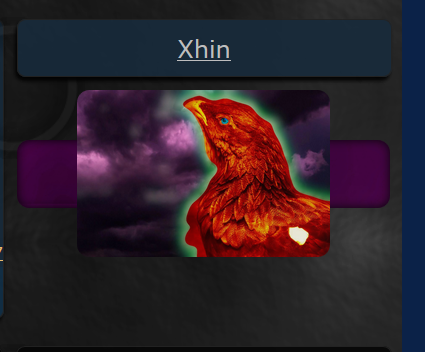 @Xhin: Is it fixed it? His profile link takes me to his profile, maybe you just need to clear cache or Ctrl + F5 if you are on a PC. =The link to viewing your profile took me to hell? That's not a bug, it's a feature! The link to viewing your profile took me to hell?